On the first day of the U.S. government shutdown, President Donald Trump said he was continuing to negotiate with Democrats to end the impasse over the federal budget, but warned that "it could be a long stay" as he repeated his call for improved border security. Trump has demanded $5 billion to help finance construction of a fence along the U.S.-Mexico border, something Democrats in Congress have resisted. "We are negotiating with the Democrats on desperately needed Border Security (Gangs, Drugs, Human Trafficking & more) but it could be a long stay," Trump said on Twitter on Saturday. The U.S. Senate and the House of Representatives were in session on Saturday as congressional leaders tried to hammer out a spending agreement to end the stalemate. Trump invited several lawmakers - all Republicans - to the White House on Saturday to discuss the situation, including immigration hardliners from the House Freedom Caucus such as U.S. Representative Mark Meadows. The caucus has pressured Trump to stick to his demands for a border wall. Senate majority leader Mitch McConnell, speaking on the Senate floor, said no votes would be held until a deal is struck by Democrats and the White House. "We pushed the pause button until the president, from whom we will need a signature, and Senate Democrats, from whom we will need votes, reach an agreement," McConnell said. Chuck Schumer, the Senate's top Democrat, then took the floor to say Democrats would not accede to Trump's demands. "President Trump, if you want to open the government you must abandon the wall, plain and simple," Schumer said. While McConnell seemed to put the onus for a deal squarely on Trump and Democrats, Schumer urged Congress' Republican leaders to get involved in negotiations. "Leader McConnell must agree. Speaker (Paul) Ryan must agree. They cannot duck responsibility. Leader McConnell still controls this chamber. Speaker Ryan controls what reaches the floor of the House," Schumer said. Schumer said discussions were ongoing at the staff level, but there were no outward signs that progress had been made. 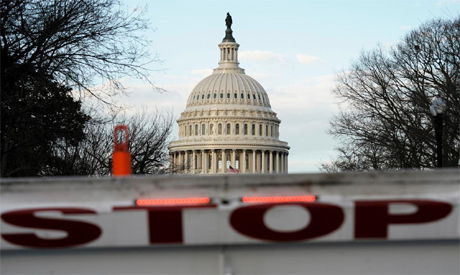 The shutdown went into effect after Trump threw a wrench into the works earlier in the week by refusing to agree to a short-term funding deal cut by Democratic and Republican senators because it did not include funds for his border wall. The U.S. House of Representatives, where Republicans have a majority until Democrats take over on Jan. 3, passed a bill that included the $5 billion, but it ran aground in the Senate and the shutdown began at midnight on Friday. As the clock ticked toward Friday's midnight deadline, Trump tried to blame Democrats. "We're going to have a shutdown. There's nothing we can do about that because we need the Democrats to give us their votes," he said in a video posted to his Twitter account two hours before the deadline. Democrats repeatedly reminded Trump, and voters, that he said last week he would be "proud" to shut the government down in order to get wall funding. "President Trump has thrown a temper tantrum and now has us careening towards a 'Trump shutdown' over Christmas," Schumer said on the Senate floor on Friday. About three-quarters of federal government programs are funded through to Sept. 30 next year, but the financing for all others - including the departments of Homeland Security, Justice and Agriculture - expired at midnight. Federal parks are closed and more than 400,000 federal "essential" employees in those agencies will work without pay until the dispute is resolved. Another 380,000 will be "furloughed," meaning they are put on temporary leave. The U.S. National Parks will generally remain open with a skeleton staff, though an alert posted on the website of the National Park Service said some parks are closed completely. Republican governors in at least two states were working to make sure public restrooms get cleaned and visitor centers stay open. For the shutdown to end, both the House and the Senate will have to approve any deal negotiated between Trump's team and Republican and Democratic leaders. In a joint statement on Saturday, Schumer and House Democratic leader Nancy Pelosi said that if the shutdown continues, the new House Democratic majority will quickly pass legislation to re-open government when it takes office in January. The shutdown comes at the end of a perilous week for the president, with Defense Secretary James Mattis resigning in protest after Trump's sudden decision to pull U.S. troops out of Syria. The Syria move was widely criticized, even by senior Republicans in Congress. The political turmoil added to fears about the economy plaguing investor sentiment, helping fuel continued heavy losses in the stock market on Friday. While Trump made the promise of building a border wall a fixture of his 2016 election campaign, it is not a top-tier priority for most Americans. According to a Reuters/Ipsos poll in late November, only 31 percent of those surveyed said improved border security should be among the top three priorities for Congress. That suggests Trump is taking a political risk by gambling on a shutdown to press his point as Democrats are gearing up for the 2020 presidential primary elections and looking for issues to seize on for an advantage. The longest federal government shutdown, lasting 21 full days, occurred in December 1995 and January 1996, triggered by conflicts between Democratic President Bill Clinton and congressional Republicans over Medicare funding and government spending. Clinton is widely viewed as having won the political battle over the shutdown, and was re-elected for a second term in 1996. In 2013, the government shut down for 16 days after conservative Republicans demanded to strip funding for or delay implementation of Democratic President Barack Obama's signature healthcare legislation, the Affordable Care Act. Republicans suffered plunging public opinion polls and eventually capitulated, agreeing to fund the government and raise the debt limit.